Back when I was first developing Long John, there was a skip where I almost threw away the concept to go with a more episodic-styled adventure series focusing around The Johns. The nice thing about not going with that idea is that it’s not ruled out, either. Maybe some day down the road an anthology could be made with disparate stories of The Johns’ adventures. This brief distraction away from the Long John premise was based on the fact that I kind of love The Johns, to the point where I think it would be very fun and rewarding to write the the three of them playing off of each other. Especially with each John being a different age and from a different culture, the opportunity in writing stories around them seemed vast and varied. The very first Long John design document, from 2002 or 2003. Click image for a larger version. What this told me is that this interplay and history and difference of character needed to come through when The Johns actually showed up in Long John proper. It’s a backwards process, in a sense, because you have to convey a career’s worth of not only experience but also friendships, partnerships, fights, successes, failures, etc. through the lens of betrayal. While I want to impart the weight of their long history with each other to the reader, I can’t forget that we’re basically seeing this story through Long John’s eyes, and he is very upset because, you know, he was very nearly murdered. By the two people closest to him in his life. It’s heavy. We met Jonny Mono in Chapter 2, though he was very much in business mode and we didn’t get a lot of good conversation out of him (due to Jonny running for his life). And though we met him briefly at the end of Chapter 2, it’s Chapter 3 where we really get to meet Juan John. He may be my favorite John. Second page from the first LJ design doc. The first designs for Juan and Jonny Mono. It’s surprising how much has survived into the final product over a decade later. Click image for a larger version. 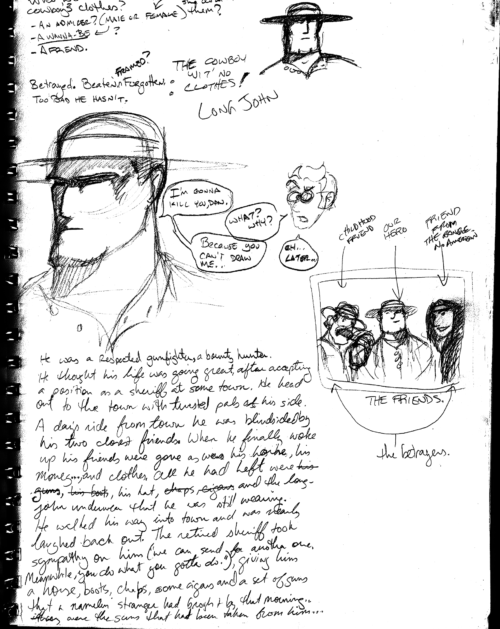 While digging through old sketchbooks, I finally found the original “design documents” for the Long John concept, drawn at the small dining table at a friends’ house in Stockton, California back in 2002 or 2003. The designs are old and in a very different style, but looking at what was written and drawn, I’m shocked at how much from this original concept has carried over to the actual comic. 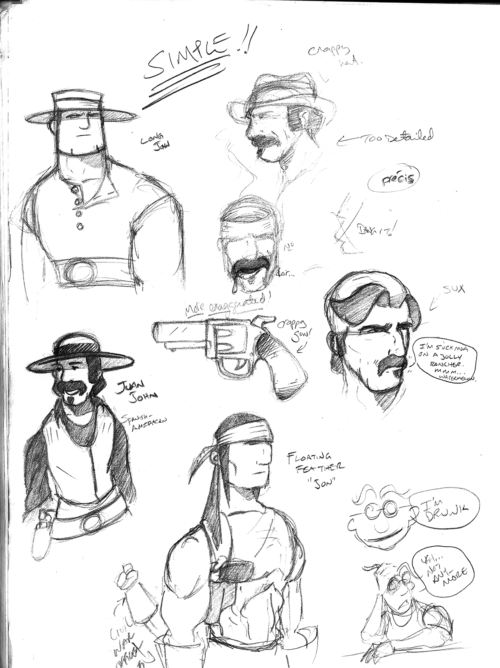 From Juan John’s facial hair to Jonny’s bandana to the opening scenario, a bulk of what makes Long John was there in these two pages of questionable design choices and a handful of bad drawings. When it came to redesign Juan John, I aged him quite a bit. 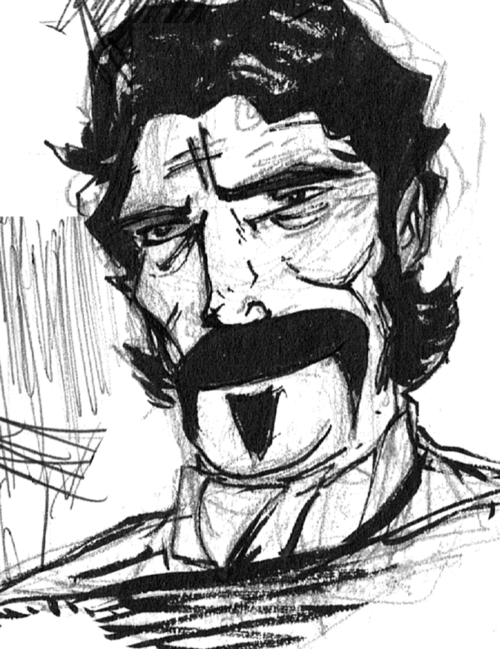 In the first “good” redesign of his face, I realized I kind of make him look like a hispanic Al Swearengen from Deadwood, which I was more than fine with considering that character had a sharp wit and knack for survival as well. The first attempt to redesign Juan John. Originally published in the physical book of Chapter 2. The one bit I regret in the initial design is covering him in a traditional poncho. What’s aggravating is that doing that was the easy way out. What’s more is that a poncho is decidedly not Juan John. He’s the guy that is always dressing well, who presents a much more together person than is actually there. 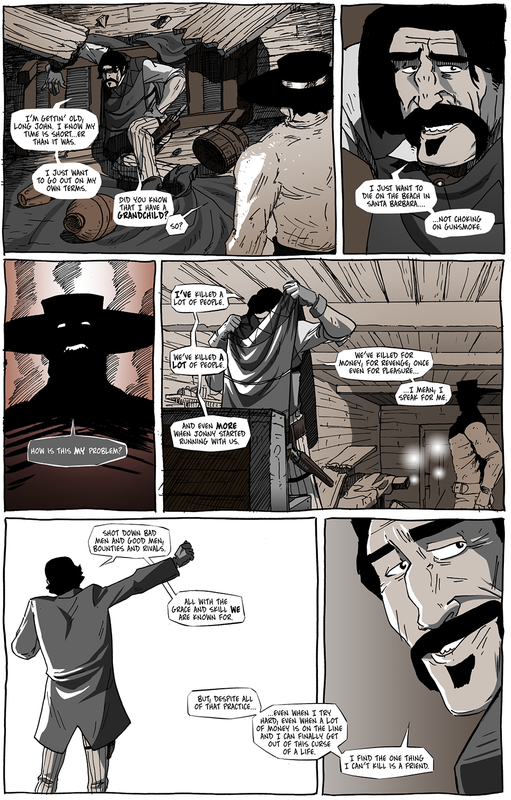 He’s the guy that’s pressing his pants over the fire and hanging them up before going to sleep out in the middle of nowhere because, “Wherever I go, I gotta look good.” So, yeah, the actions on this page are me correcting an error because I needed to make Juan John Juan John. And that required a nice coat, not a poncho. On the plus side, it gave a nice framing action for the monologue, so it looks like it was all planned. I’m just glad we got the real Juan John up there sooner rather than later, because he’s the best.